For some home situations and for many business situations there are a range of good benefits to be had from a central master key system. What is meant by a master lock system is the existence of a master key. Or a grand master key, which opens all the locks in a series of access levels. A master lock system is a great way to moderate access levels within a business. Easy to manage up to a certain size and a great way to keep the right people with the right level of power. If you are interested in finding out more about what a master key lock system can do for you. Speak to our skilled master key lock system specialists today. Help with guidance, advice and installation is available from our friendly hard working advisers at times that suit you. Competitive in price, and ready for your call. There are a range of options that we can have a look at together. For some buildings a re-keying service is all that will be needed to get a master key and lock system in place. Speak to us about your requirements as soon as today and have your master key system up and running as soon as possible. 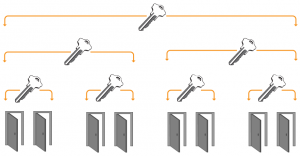 The main security benefits and pitfalls lie within the number of keys that you produce. There need to be good security procedures in place to ensure that the keys involved in the system are not lost or at chance of going missing without you knowing about it. For caretakers, buildings with offices, cleaning cupboards, stationary access doors and more a master key lock system is highly beneficial as an addition to the security which is already in place. Contact us now for a discussion about your specific needs. Is it worth investing in a master lock key system? The value of a system with a master or grand master key. And a key hierarchy is in theory a great idea and can work wonderfully well for a range of different businesses, organisations and even homes. However, it’s not a system that will work well for everyone. If there is a chance that administration errors and organisation faults will happen. Keys can get lost, and security can be compromised without notice. Or worse, there can be a breach of security and keys can be duplicated without the consent of the higher ups on the hierarchy. Then this system is not for you. The home security situations where master key systems work wonderfully well is where there are service staff, cleaners and other personnel which are not allowed access to certain areas of the home. After all, there is a need for privacy in this day and age, and with a busy job, a family and a full life. The last thing you want to worry about is security issues. For help with master lock key system and having one installed. Alternatively having locks re-keyed and set up for a master lock key system. Get int ouch with our fast and experienced workers today. We’re always here to assist you in a way that makes sense to your schedule and your security plan. Each security master lock system is unique, as is each master key lock system situation. Something that our trained and caring team understands well. There are of course a range of options of security levels and key levels that need to be discussed and put into place if a system such as this is made put in place at your home or workplace. Speak to us now and ask us your master key lock and security questions today.